Synopsis: Ellison Oswalt (Hawke) is a true-crime writer who hit it big with his debut book years ago and in an effort to write his next hit, he moves his family into a house where a tragedy occurred - one child went missing while the rest of the family was killed. After Ellison discovers a box of film reels showing the previous family, plus others from diff decades, being killed - and a demonic looking figure that appears in each one - he becomes obsessed with discovering the nature of the reels. Andrew: Hello readers! So last night I was able to catch an advance showing of this weekend's new horror movie, Sinister, starring Ethan Hawke and brought to us by the same folks who brought us the Paranormal Activity films and 2010's Insidious. Sarah, you didn't go to this one with me because these kinds of haunted house/haunted family movies are not your cup of tea (and by that I mean you wouldn't have slept at all last night). So we're gonna do this the old fashioned email way and you're going to interview me. So with that said, fire away! Sarah: Yea there was no way in hell I was seeing this one, or will probably ever see this one. That being said...what did you think? A: In short, I thought it was one of the better horror movies to come out in a couple of years, but it's not great. If I ranked it up against the movies I mentioned earlier, I'd put the PA movies and Insidious ahead of it, and in that order. The best part of the movie is Ethan Hawke as the main character, Ellison Oswalt. He's a true-crime writer who hit it big ten years prior with his first book called "Kentucky Blood" but his second and third efforts weren't nearly as good and one even apparently let a killer go free because he screwed up the prosecution's investigation. I liked that aspect and I liked the Hawke plays Ellison as this family man who has become desperate enough to regain that fame and fortune that he'll risk his family by moving them into a house where the prior family was murdered, and not even tell his wife that it happened. 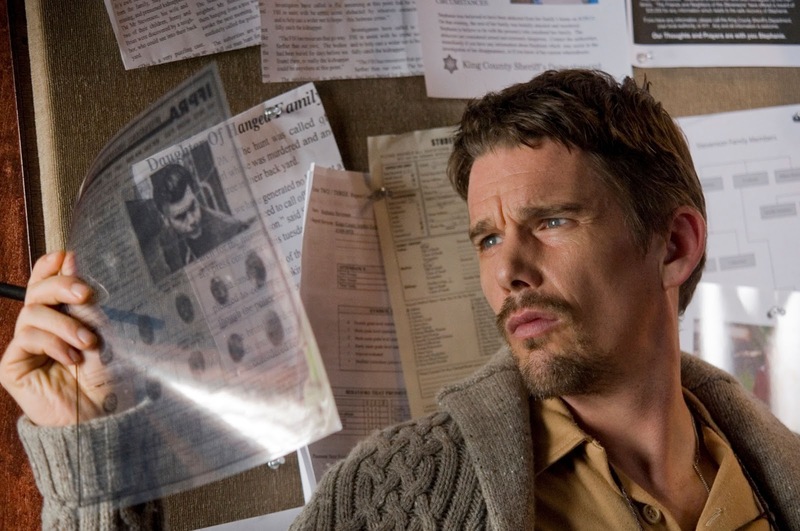 Ethan Hawke plays Ellison Oswalt, a true-crime novelist who hit it big with his first book and is struggling to find the same success so he moves his family to different towns where grisly crimes occurred so he can write about them. S: Well that would not fly in our household, FYI. So this evil spirit that seems to be showing up in this movie...when we have talked about this before there has been some talk that he might be the next big thing as far as horror characters go. Would you think that is a correct assessment of him? Or is he just another ghost in a semi-scary movie? A: Yeah, the evil entity in Sinister is an ancient Pagan deity called Baghuul (and also referred to in some instances simply as Mr. Boogie) who is said to eat the souls of children. Pretty wicked stuff, if you ask me. I think he's a fine villain for the film particularly because of how he looks, what with his prominent cheekbones and no mouth to speak of, and the fact that he's not a speaking character. All he wants to do is eat the souls of children and murder the child's family in varying and inventive ways in the process. He's not a spirit to be trifled with. But what makes him particularly spooky to me was that even as Ellison is finding things out about Baghuul and the missing children from these old Super 8 films he finds in the attic that show the deaths of all the family's Baghuul has killed is that you eventually figure out what exactly Baghuul is trying to do and how he's going to do it. It's that realization that's pretty creepy, because until then he more or less haunts Ellison and his family. So I can see a possible franchise being made from these movies in that fact - he's just plain evil and there's really nothing they show in this film to show that he can be defeated, so I'd be interested in seeing if there IS a way. S: Super creepy, not a fan! Now you mentioned Ethan Hawke a little bit already but what I want to know is, was he believable? So many times in scary movies, the actors seem a little cheesy and campy. I haven't see Hawke in much, so I don't have much to base him on but I would like to know if he plays terrified well. Does he really embody the writer's spirit that he is willing to put his family in harm’s way to jump-start his flailing career? A: He absolutely does all of those things. I bought him as a struggling writer hook, line and sinker. And it's not just the way he looked, which was kind of haggard and it got worse as the film went on, but it was how he acted and the believable performance he gave of someone who's essentially becoming obsessed with something he really shouldn't be getting obsessed with. The whole movie hinges on whether or not you believe his fright, the growing sense of dread as he gets deeper and deeper into the mystery. And Hawke totally sells it. Some of the best scenes in the whole movie are just him sitting in his dark office watching the Super 8 film, taking notes, not saying a word. All the language he needs to say in those scenes are said through his eyes and reaction to what he's looking at. It's powerful stuff at times. 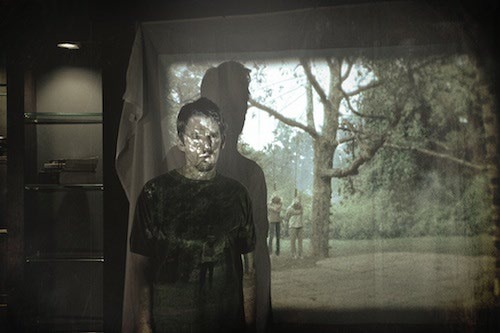 Some of the best scenes in Sinister are simplistic: just Ellison watching the horrifying developments on the Super 8 films he finds, testament to Hawke's performance here. Then later in the movie when the crap is really starting to hit the fan and every common sense bone in your body is screaming at the screen, "MOVE OUT OF THE HOUSE, IDIOT!" Hawke is also able to sell the fact that Ellison, as a desperate writer who wants ANYTHING but to be relegated to writing or editing college textbooks, will keep his family in danger to write a killer book. Hawke nails a great line that totally could have come off as cheesy when he's in a fight with his wife and finally says, "This could be MY 'In Cold Blood.'" the true-crime book that Truman Capote is most famous for. So yes, Hawke really does embody his character perfectly. S: As far as the actual horror part, did it stick more with just the sense of dread or was there gore and violence that went along with that dread? If there was, do you feel that it added to the story or took away from it? A: That's a good question. 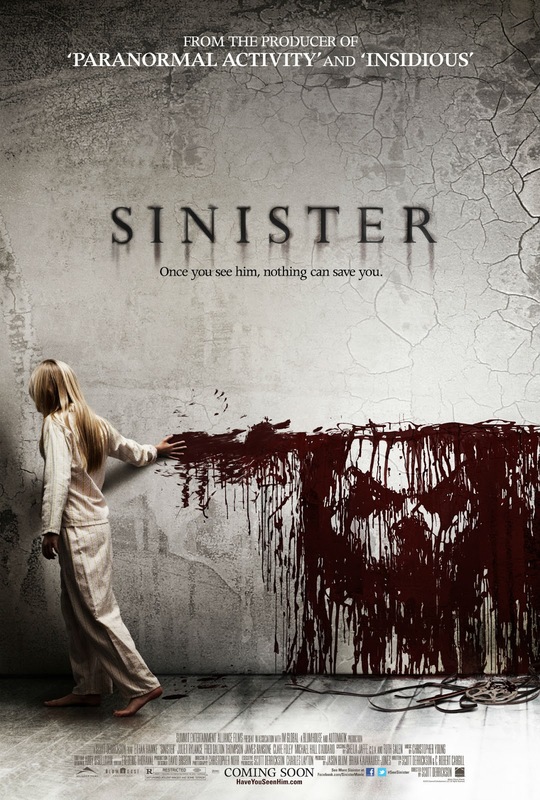 Sinister is rated R for disturbing violent images and terror, and what it means by that is it shows a little bit of the violence that goes into killing the families but isn't overly gory. For instance, one family is drowned, one family is burned to death, one is hung by a tree...those are all seen can be categorized as violent/grisly and they are. But they're not gory. The only real gore is another film Ellison watches where a knife is involved, but the way they shoot it you only see what's happening on the screen Ellison is watching in a reflection in his glasses. So you see it a bit, but not entirely. Then another involves a lawnmower and that's pretty much implied and not shown. So much like Halloween, I liked that it used simpler tactics and didn't need to use copious amounts of blood to get the job done. It makes you use your imagination to fill in the blanks and that, sometimes, can be even more horrifying. 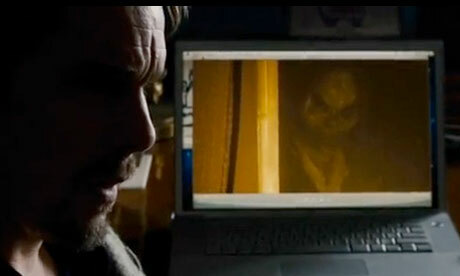 Sinister's villain, an ancient Pagan deity named Baghuul who consumes children's souls and uses pictures/video of himself as a portal to his realm, is efficiently creepy and could make a solid franchise villain. You really love horror movies and, in my opinion, set the bar pretty high for them. Compared to some other horror movies that you love and hate, where does this one fall? Halloween being the top and Chain Letter being the worst? A: Oh man, that's a tough one because I've seen a lot. Not as many as total die-hards but certainly more than your casual movie-goer. Like I said earlier, I'd rank it behind the Paranormal Activity movies and Insidious, but I hold those films in relatively high regard because they're excellent at setting a sense of dread and sticking with you when you go to sleep. Sinister didn't do that with me. I'd put it in the upper half of horror movies that I've seen, and certainly better than most that have come out in the last decade or so. It's highly entertaining, it's creepy, has a nice mixture of creating a true sense of dread while giving some boo scares, has a great score (particularly during the scenes where Ellison watches the film), has really good cinematography and can be pretty funny when it wants to be. There are sometimes it's unintentionally funny, which I knock it down a bit for, and seasoned movie-goers and horror buffs might be able to put the mystery together pretty quickly but at the same time the way the story is structured means that's okay in the end. S: So overall, What would you give Sinister? A: Overall, Sinister is a good but not great horror movie. It's entertaining enough that I would say for the Halloween season, if horror movies are your thing or you're looking for a good movie to take a date to so she'll hold your arm during the scary parts, definitely see this in theatres. FINAL VERDICT: A good horror movie to see in theatres for the Halloween season! Good review. Didn't have me terribly freaked-out, but still gave me chills here and there and made me feel the same terror that Hawke was displaying so perfectly. Great movie for the Halloween horror season. Thanks Dan! Yeah, it wasn't a film that "terrified" me but consistently left me chills running up my spine as I waited for the next bad thing to happen. It's atmosphere was really good. I'm not sure I'd take a date to it. My girlfriend was pretty angry with me after watching the film. I guess hangings and slit throats aren't her type of thing... Shucks. I agree with your review, I rated it a tiny bit higher because I enjoyed the Paganism behind it. Glad to read this is good, I have yet to see Paranormal Activity movies but I enjoyed Insidious a lot and lately it was hard to come by a good, creepy horror movie.